A delegation of the KTH Royal Institute of Technology, headed by Prof. Albania Nisssan, the PUA-KTH Project Leader, paid a three-day visit to the faculty of Engineering- Pharos University on 3-5 March, 2019. The delegation was received by Prof. Norhan Fanaky, the Vice-President for Education and Student affairs; Prof. Mohamed Gaber Abou Ali, the Dean of the Faculty of Engineering; Prof. Mohamed Naeem Anwar, the Vice Dean of the faculty of Engineering for Education and Student affairs; Dr. Mohamed Abdel Fattah Ragab, the Secretary General; Dr. Mennatallah Gowayed, the International Relations Coordinator of Pharos University and Dr. Amr El Saddany, the International Relations Coordinator at the Faculty of Engineering. Heads of departments and members of the international relations committee were also present to welcome the delegation. The visit programme included convening meetings between the two aforementioned parties, delivering lectures to the students of the faculty of Engineering by KTH professors, and holding a ceremony by the end of the visit, under the auspices of the faculty of Engineering, to celebrate the 10th anniversary of the signing of the cooperation agreement between Pharos University and the KTH Royal Institute of Technology. 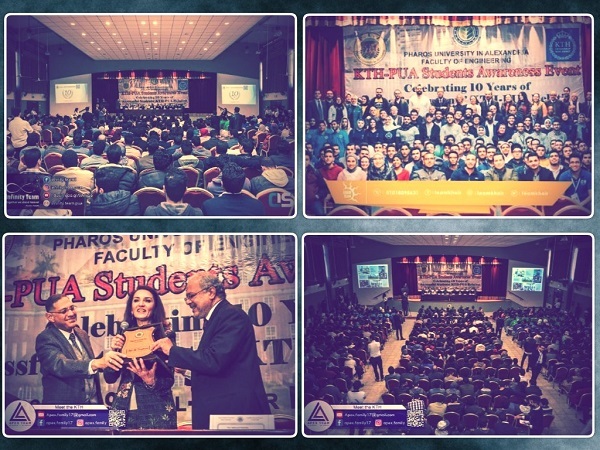 The ceremony was held in the presence of Prof. Mahmoud Mohy El-Din, the President of Pharos University; Prof. Mohamed Gaber Abou Ali, the Dean of the Faculty of Engineering and Dr. Mohamed Abdel Fattah Ragab, the Secretary General. 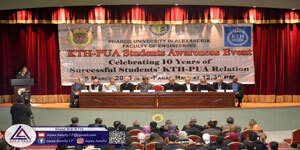 Heads of departments, academic staff members and students also attended this ceremony. In his word in the ceremony, Prof. Mohamed Gaber Abou Ali, the Dean of the Faculty of Engineering made a presentation about the relationship between Pharos University and the KTH Royal Institute of Technology. This was followed by another presentation for Prof. Albania Nisssan, the PUA-KTH Project Leader, to acquaint the students with the advantages of the PUA-KTH cooperation agreement and how to derive the maximum benefit from it. A documentary was then shown about the workshop held between the Architectural Engineering Department- Pharos University and the KTH Royal Institute of Technology. 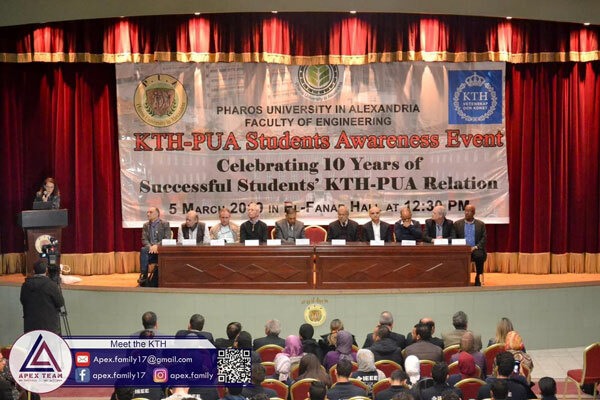 By the end of the ceremony, the KTH delegation was honoured for their valuable and substantial contributions towards developing a PUA-KTH effective partnership during the past ten years.